Websites can notify you of new posts and news stories, but do you need them? 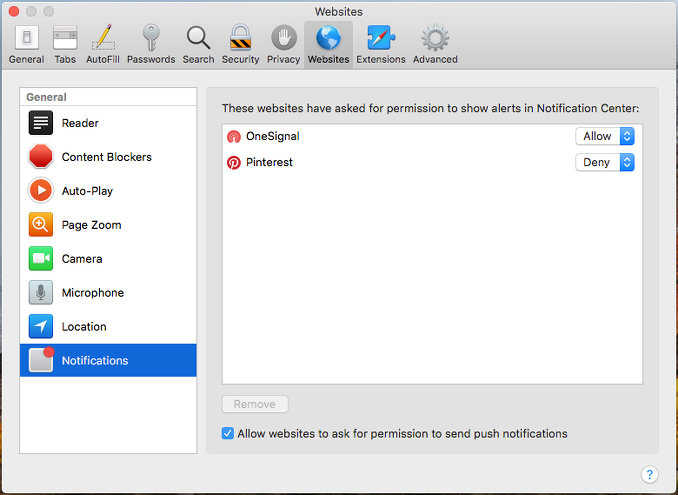 How do you stop website notifications in Safari and Chrome? see how to allow or block them in your browser. When some websites are visited, you may see a pop-up message box asking if you would like to receive notifications. Have you ever clicked Yes, OK or Sure? Notifications can be about anything but an obvious use is to notify you when a new article is posted, a new news story, a new special offer or the ending of a special offer, or just a message to say come and visit because the site misses you. Website notifications can be very useful but sometimes they can be irritating. The trouble is you will not know which they are until you click the accept button and try them. Most likely, there will be some you love and others you don’t want to see – a bit of a mixture. How do you opt out of website notifications in Safari on the Apple Mac or Chrome on the Mac or PC? 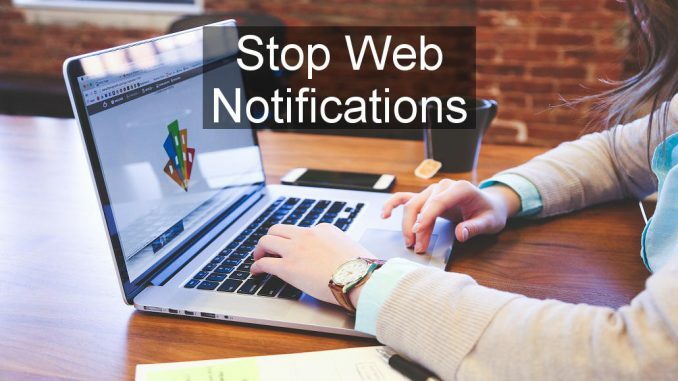 How do you stop all website notifications from appearing? You might not want to even see the permission request pop-up message at all. Can it be blocked? The switch at the top, Ask before sending, is an on/off switch that determines whether notifications are allowed or not. Turn it off to disable all notifications and requests or turn it on to allow sites to ask permission to show notifications. Below is a Block list and an Allow list. As you browse the web you might allow some websites to show notifications and decline the offer from others. They appear in the Allow and Block lists. Click the Add buttons to manually add URLs to each list. At the right of each URL is either three dots or a jigsaw puzzle piece. Click the three dots to display a menu that enables the site to be moved from Allow to Block or Block to Allow. The item can also be edited or removed. The puzzle piece icon means that an extension has control of the notification status. In the screenshot Google has allowed notifications on its own sites. You would have to remove the extension to stop the notification. Notifications in Safari on the Apple Mac have similar features and only the interface is different. Go to Safari > Preferences > Websites and select Notifications in the list of items. Each site you have responded to is listed and at the right is Allow or Deny. Click it to change it from one to the other. To remove a site, select it in the list and click the Remove button below. 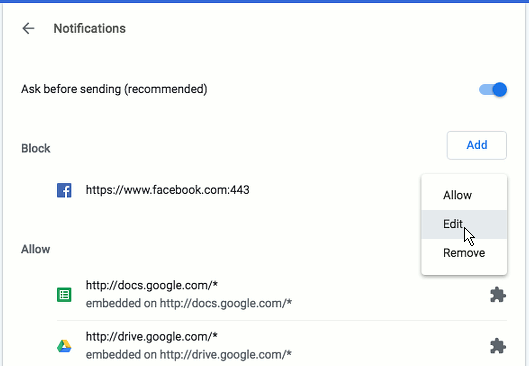 Down at the bottom of the window is an option to Allow websites to ask for permission… If this is ticked, websites can show the pop-up request to allow notifications, but if it is cleared, then no pop-up notification request appears. Whether you block requests to send notifications or whether you allow some sites to show notifications is entirely up to you. Their usefulness depends on the site and those that sell goods or services might irritate you with special offers you are not interested in. An online tool, such as Google Calendar shown in the first screenshot, could be very useful by alerting you to calendar events. Which is your preferred setting for notifications? On or off?